Consist of50% of cotton and 50% of polyester. Density - 270. 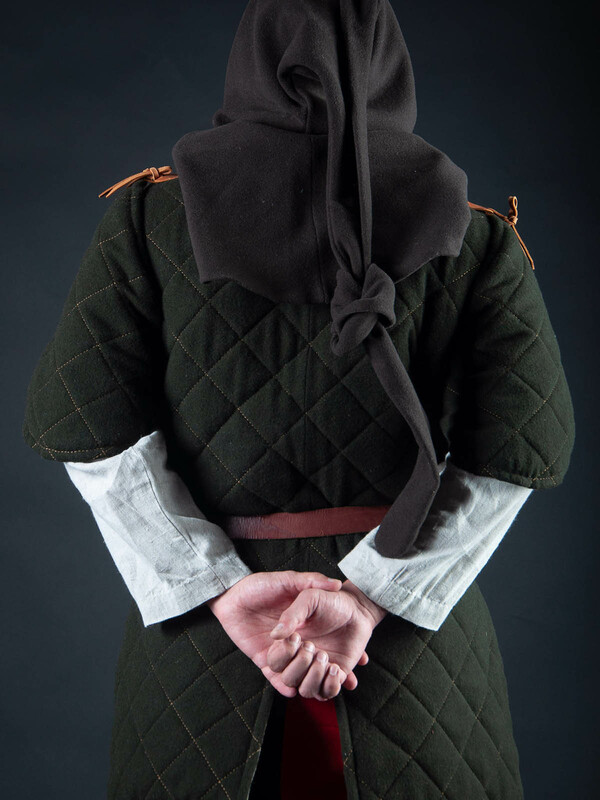 Gambeson with elbow-lenght sleeves is a multifunctional padded armor, especially good for archers. Really, look at it, you can use it in HEMA, you can use it in SCA, you can use it in… wherever (Larp, stage performances, medieval festivals, reenactment events) you want, but really it made for archery. Almost weightless and freely tailored, he does not constrain your movements at all. It protects the shoulders and elbows, but does not interfere with pulling the bowstring. 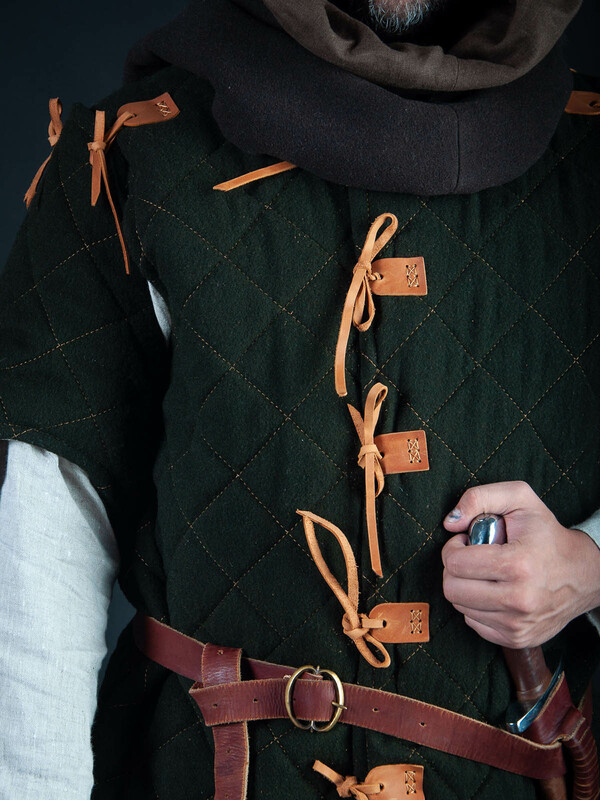 If Robin Hood were here, he would take this short sleeved gambeson. Just as medieval times, it got natural fabrics, wadding, stitching, and lacing for fastening. And now you can choose the way that your gambison will be sewn: machine manufacturing or hand sewing. As you guess, in first way tailors will make your padded armor using sewing machine, and second one is completely sewing by hands. Yes, stitch by stitch just as in medieval, for additional costs naturally. As an additional option, you may create unique model of padded gambeson armour. All the fabrics we got for outer and inner shell, leather is also available. Make a choice for colors and mono-colored or quarter-colored gambeson jacket, just inform us by e-mail, what colors you prefer and its exact disposition. 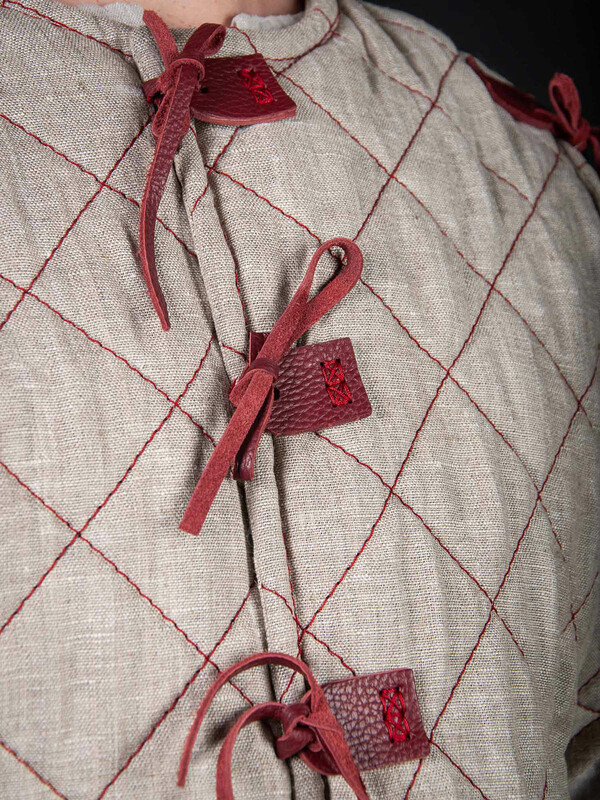 Oh, great choice of fastenings and festoons for your custom gambeson is always an option. Quantity of padding layer is also an option, 5-6 layers under the chain mail, or 2-3 layers under usual plate armour or brigandine usually enough. However, if you need something special, inform us. 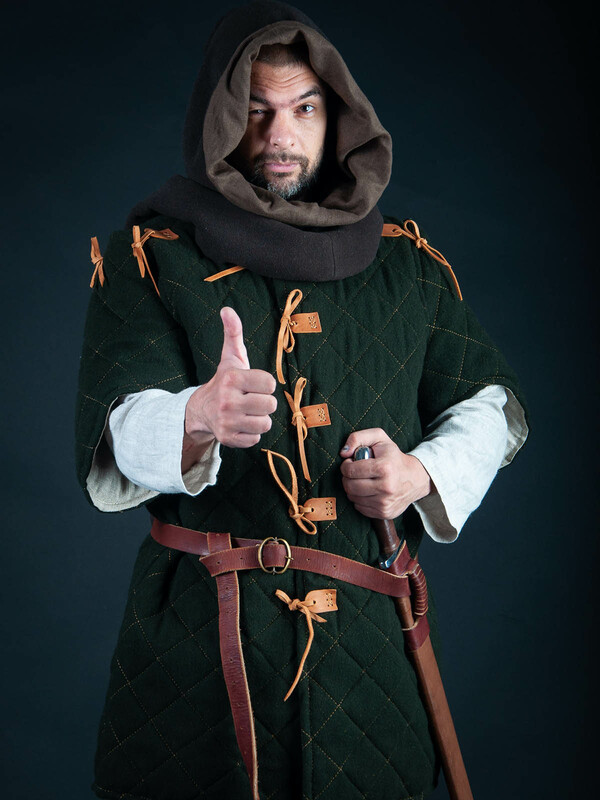 Don’t forget to order leather fastenings for steel arms in black, red or brown leather, if you plan to use plate arms or spaulders over your gambeson armor. Check out these models of long gambesons: HEMA style gambeson, long gambeson of the XI-XV centuries. We offer to complete your body protection with brigandine, cuirass or chain mail. In section “Gambison”, you can see all models that we offer for ordering. If you did not find any for your taste and wish, please send us photo and description of the required model and we will make it for you. Outer fabric of one color . Right side of outer fabric has one color, left side has another color. 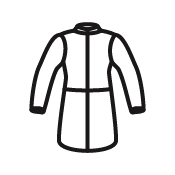 Colors of outer fabric are placed in chessboard-shaped layout. We use wool with maximum 20% of synthetic fibers. It adds hardness and durability. Historically authentic material. We use natural leather of chrome tanning. Firm, durable material, harder than wool. Historically correct material. 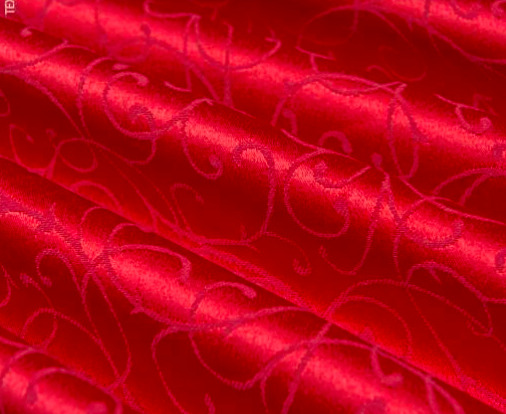 We use velvet with maximum 20% of synthetic fibers. It adds hardness and durability. High-status material, point out the wealth of owner. “Those who wears velvet don’t split logs”. Historically authentic material. Steel lamellar armor or Khudesutu Khuyag Here is Khudesutu Khuyag for your attention – respectable, grand lamellar armor of the noble Mongol warrior. It is wide and massive; it inspires with respect and deters an enemy. This typical representative of protecting outfit in the Great Steppe, which was not as wild as one got used to consider. To the XIV century, it’s been a long time since Mongol army got dressed in trophies from raids, as Chingisids set up production of Mongol-Tatar armor on the commercial scale in the conquered regions with high level of handicraft industry. Iranian miniatures are a real goldmine of information of how medieval plate armour Khudesutu Khuyag was looking like in the XIII-XV centuries. Essentially, types of Mongol armor could be divided by materials (hard and soft) and by design (cuirass-like and vest-like models). Our today’s hero is a cuirass-like Khudesutu Khuyag with spaulders and skirt-tasses. It has been carefully reconstructed by painting sourc.. 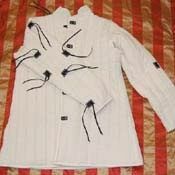 This long and wide coat with two-layers sleeves is the wonderful addition to the dress "Forest Queen" or any other garb. - edges of collar, sleeves and hem are decorated with very beautiful braid; - sleeves have lining of contrast colour; - in front it is fastened with 10 metal buttons. The coat can be made of 100% natural linen or wool in different colours. If you have any wishes regarding colour of sleeves' lining or braid, please contact us [email protected] .. 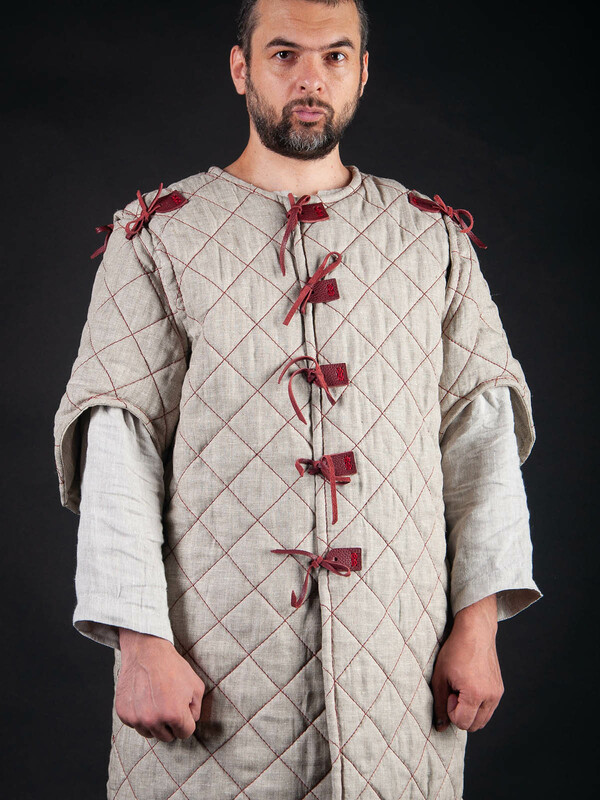 This set includes: Medieval gambeson Long-padded chausses Padded cap with pelerine This simple and popular model of medieval gambeson of XI-XV century is suitable for usage for both, men and women. 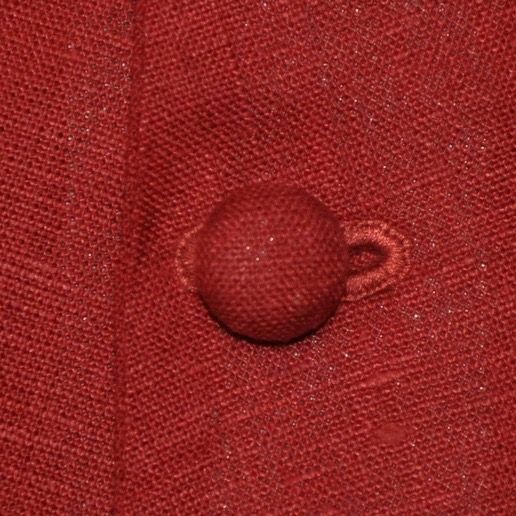 We use only 100% natural fabrics of different colours for gambeson manufacturing. Additional options allows you to create unique model of gambeson. 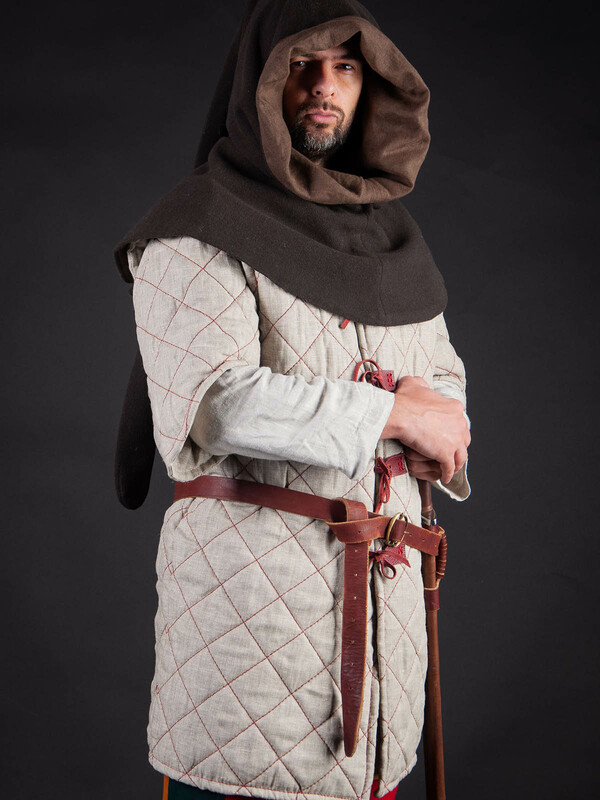 The padded chausses are perfect protection of your legs during medieval battles or trainings and can be used with any type of armour. Chausses have one layer of padding, but you can order more than one layer. Belt is not included to the price. Pelerine is being fastened to the padded cap with leather string. Cap is used as liner for helmet and provides with perfect additional protection during the medieval fencing. ..
Black atlas corset with minimal decor. From the front decorative lacing from the velvet braid. From from the backside - functional lacing. Descriptions: inner layer is glued with cotton sheeting (Germany) linen lining all seams are reinforced with spiral steel bones (Wissner) the waistline is reinforced with braid ..
Middle Ages women's clothing Historians tell that medieval Europe was under the sway of Little Ice Age, that’s why our ancestors were wearing multilayered clothing. Surely, it may inconvenience during the summer festivals, but definitely comes in handy at autumn and winter events. We decided to free you of these difficulties and gladden with only positive features of medieval costume. So, we made this set of the Middle Ages women’s clothing, which will be perfect as for warm weather, so for cold one, depending on the chosen fabrics. Therefore, it will be not only beautiful, but also quite practical element of your wardrobe. This cross-functional set includes two pretty medieval dresses – kirtles. Lower dress is made of strong cotton. Long sleeves of average width are pleated at the wrists. Lacing on the back of dress allows good fitting on the figure, so look of this fancy medieval dress will glad a wearer and others. This Middle Ages dress may be worn as underdress, so independent clothing element. Depending on the chose..